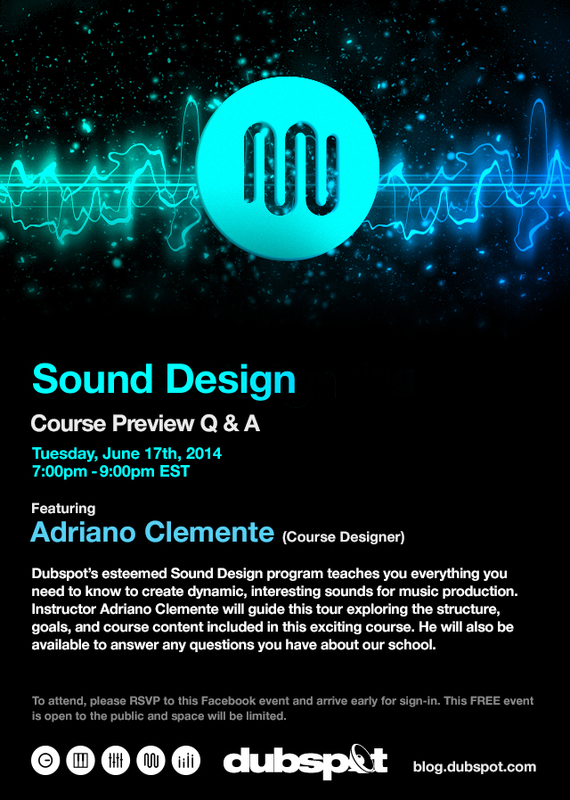 Sound Design Course Preview, Q&A w/ Dubspot Labs Director Adriano Clemente – Courses begin 6/24 in NYC! Join us on June 17th at our New York location for a very special course preview event showcasing our newly redesigned Sound Design program with instructor Adriano Clemente. Sound Design courses begin 6/24 and 7/12 in NYC so see what this course has to offer! When you’re ready to go further with your music education, check out our newly redesigned Sound Design program where you’ll sculpt your own sounds, program your own patches, and understand signal flow with Native Instruments’ Komplete software. Our new sound design course is the perfect compliment to your production skills and will help you develop a unique sonic signature with your productions. At this course preview event, Dubspot instructor Adriano Clemente will explain the structure, goals, and content included in this course. He will also be available to answer any questions you have about our school and to share some tips for creative sound design. To attend, please RSVP to the Facebook event and arrive early for sign-in. This FREE event is open to the public and space will be limited. Adriano is an Italian Artist, Composer and Thinker who uses technology to improve and evolve the relation between humans and their creation process. After years of classical piano studies at the conservatory he discovered different ways to express his creative power with the computer music. In the following years he graduated in composition and computer arrangement at the Saint Louis College of Music and at the same time he took a Psychology degree at La Sapienza University of Rome. In 2008 Adriano won a scolarship for the European Institute of Design (IED), where he worked as an assistant for the Sound Design course coordinator. Adriano’s expertise goes from music production to work with movies and TV shows, Web content, Radio and live performance/DJ. He is based in New York City where he recently presented an interactive sound runway for the 2014 Mercedes Benz Fashion week. He also worked on an immersive Audio/Video installation called Video Park as part of the Super Bowl Boulevard in Manhattan. Adriano teaches Ableton Live and Sound Design Classes at Dubspot and he has taught as guest lecturer at Stony Brook University, Brooklyn College and SVA. Adriano teaches Music Production with Ableton Live and Sound Design using Native Instruments Komplete at Dubspot NYC. Keep up with Adriano Clemente on Twitter, SoundCloud, and at AdrianoClemente.com. Become ﬂuent in the language of sound design and synthesis with this comprehensive program. This six-level Sound Design program uses Native Instruments’ Komplete as a platform for learning synthesis and sampling techniques. Starting with an introduction to the properties of sound, this comprehensive series of courses covers the major techniques used for contemporary sound design. You will learn to create your own sounds with a variety of techniques and add a personal sonic signature to your tracks. We introduce you to the latest synthesis and sampling technologies and show you how to use the world’s largest and most diverse sound library. In the advanced levels, you will acquire total control over all aspects of the Komplete instruments while practicing genre-based sound design.